Bharat Natyam: traditional Indian style of dance. Brahmacari: unmarried male devotee practicing celibacy. Brahmacarini: unmarried female devotee practicing celibacy. CIS: Commonwealth of Independent States (the former Soviet Union). Darsana: an audience with the Supreme Lord or His representative. Ekadasi: The eleventh day after the full and new moon, a special day for increased remembrance of Krsna. Abstinence from grains and beans is prescribed. Food for Life: charitable food distribution program run by Hare Krsna devotees worldwide. FSK: formerly the KGB, now reorganized. Gandharva: extraordinarily beautiful demigod singers and musicians. Gaura-arati: evening prayers in the temple..
Gulabjamun: traditional Indian sweet made of milk and flour, rolled into balls, deep-fried, then soaked in a sugary syrup. Guru-puja: worship of the spiritual master. 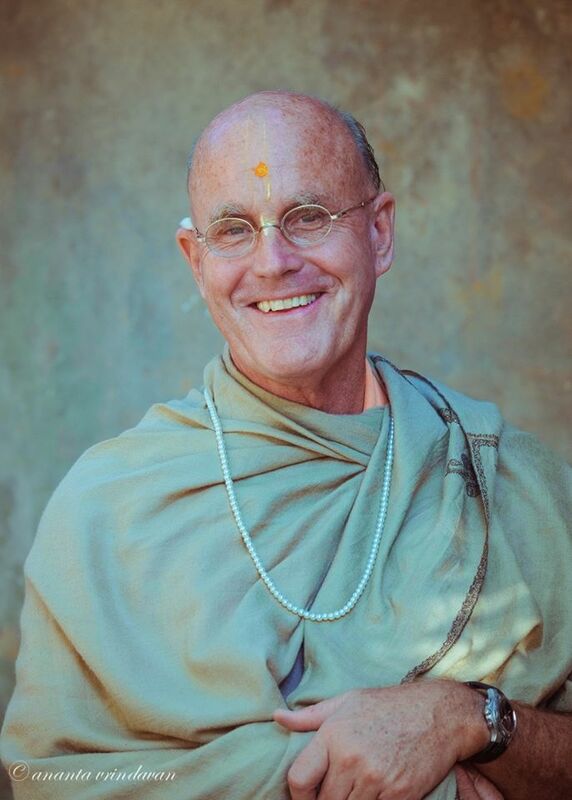 Gurukula: the school of the spiritual master, traditional Vedic education. Harinama:public chanting of the holy names of the Lord. ISKCON: International Society for Krishna Consciousness. Ista-gosthi: discussion amongst temple devotees. Janmastami: the anniversary of Lord Krsna’s appearance in this world. Japa: soft recitation of the Lord’s holy names as a private meditation. Jnani: one who tries to understand the Supreme through the process of speculative knowledge. Kali-yuga : (Age of Kali) the present age, characterized by quarrel. It is the last in the cycle of four ages. The present Kali-yuga began 5,000 years ago. Kamsa: Krsna’s uncle, who constantly plotted to kill Krsna. Kirtana: congregational chanting the holy names of the Supreme Lord. Ksatriya: a warrior or administrator. The second of the four Vedic social orders. Kumaras: four learned ascetic sons of Lord Brahma, appearing eternally as children. Laksmi: colloquial term for money, in reference to Srimati Laksmi devi the goddess of fortune and eternal consort of Lord Narayana. Lord Jagannatha: the Supreme Lord, Lord of the Universe. The Deity form of the Lord at Puri, Orissa. Lord Nrsimhadeva: the half-man, half-lion incarnation of the Supreme Lord. He protected Prahlada Maharaja and killed the demon Hiranyakasipu. Pranama: to join the hands, palms together, in front of the chest, in prayer or as a gesture of respect. Prasadam: the Lord’s mercy; food or other items spiritualized by being fiirst offered to the Supreme Lord. Ratha-yatra : an annual festival in which Deities of the Supreme Lord are drawn in procession upon huge, lavishly decorated, canopied chariots. Salagrama-sila: a Deity incarnation of the Supreme Lord in the form of a stone. especially through chanting of His holy names: Hare Krsna, Hare Krsna, Krsna Krsna, Hare Hare, Hare Rama, Hare Rama, Rama Rama, Hare Hare. Sikha: tuft of hair customarily at the back of the head of male devotees of Krsna. Vyasa-puja: worship of the compiler of the Vedas, Srila Vyasadeva, or his representative, the bona fiide spiritual master. Vyasasana: the seat of Vyasa, on which the representative of Srila Vyasadeva sits. Yatra: temple or area of preaching.